Live Documentary of Dance! | Pones Inc.
A dance and multi-media performance that provides an in-depth look into the current state of dance in our society. A Live Documentary of Dance! is based upon video interviews from over 100 professionals in the dance field, students, and pedestrians. 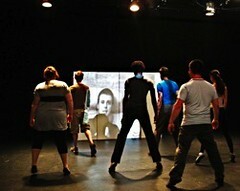 The show is presented as a ‘live documentary’ making it a living, breathing, collaborative and constantly-changing project that allows viewers a completely unique and participatory theatre experience. Live Documentary of Dance! by Pones Inc. from Pones Inc on Vimeo.